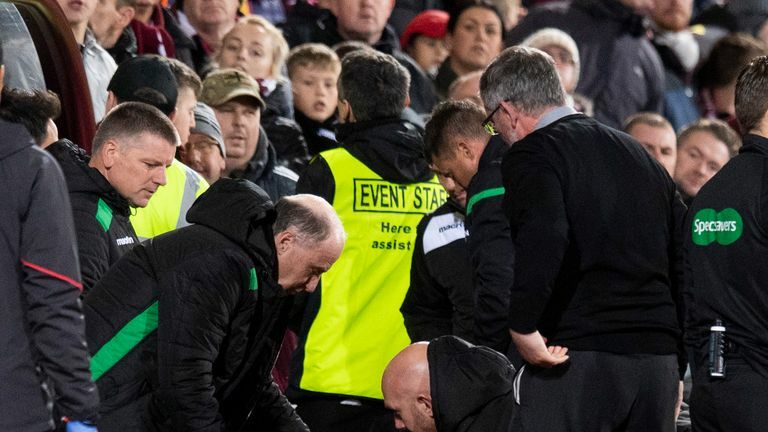 Hibs boss Neil Lennon was helped to his feet after being struck by an object from the crowd in the Edinburgh derby, while Hearts goalkeeper Zdenek Zlamal also appeared to be struck by a fan. Police Scotland have made five arrests following Wednesday's night's fractious Edinburgh derby between Hearts and Hibernian. One of the arrests was made in relation to an alleged assault of the assistant referee during the 0-0 draw. Hibernian manager Neil Lennon was hit by a coin during the match, and Hearts goalkeeper Zdenek Zlamal appeared to be struck by a fan when he attempted to retrieve the ball. Chief Inspector Murray Starkey, match commander, said on Thursday: "Police Scotland condemn the mindless acts of violence, which included missiles being thrown during last night's Edinburgh derby. "I can confirm we are investigating two separate incidents, involving the Hearts goalkeeper and the Hibernian manager during the match. "A 25-year-old man has been arrested and charged in relation to an assault involving the assistant referee. "A total of five arrests have been made. Anyone who witnessed these mindless acts should contact the police on 101." Yesterday result was 0:0, but everybody knows, who the losers are...you punched me in the face, I was ok-no big deal, but feel sorry for your personal tragedies that force you to behave like this. Our kids are watching the games and I’m sure they can recognize their real heroes. 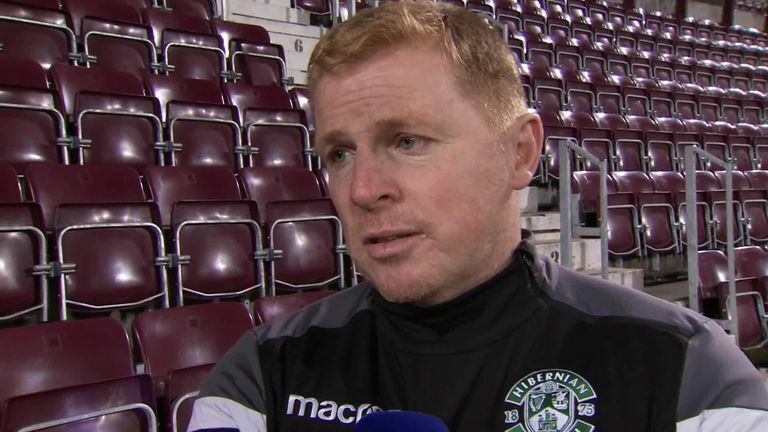 Hibs boss Lennon - who was attacked by a fan on the touchline at Tynecastle while Celtic manager - fell to the deck but soon recovered after treatment. Lennon told Sky Sports News after the game: "I got hit by a coin, it's a simple as that. Right on the chin, so it was a hell of a shot,"
"It was a pound coin as well, so the fan must be flush. Hopefully the club or the authorities can identify this guy and who knows, maybe I'll get to meet him one day. "I'm not happy with what happened to Zlamal. By all accounts, there's been an altercation with a Hibs supporter. It's totally unacceptable and from our point of view, we will try to identify them as a club and he'll never come through the door again." Asked what message Lennon had, he added: "Don't come, we don't want you here. All you are doing is blackening the name of the club." Hearts goalkeeper Zlamal wrote on Twitter: "Yesterday's result was 0-0 but everybody knows who the losers are. "You punched me in the face. I was OK, no big deal but feel sorry (for) your personal tragedies that force you to behave like this. "Our kids are watching the games and I'm sure they can recognise their real heroes."